Do you know what to do if there is a fire in your home? You can survive a fire in your home if you plan and practice your escape. Plan your escape by drawing a floor plan of your house. Show ways out of every room and discuss these escape routes with family members. Agree on a meeting place outside where everyone will gather once you’ve escaped. Now call the fire department from a neighbor’s phone or a cell phone. Teach everyone how to unlock windows and doors. Keep stairways and exits free from clutter. Teach every family member the sound of the smoke detector. Practice! Hold family fire drills at least twice a year. If you live in an apartment building or a high-rise, learn the building’s evacuation plan. Know the locations of fire alarms and exits. Use the stairs – never use the elevator. Report any locked/blocked exits to the management company. Keep a portable phone with you during an emergency. If you are trapped, seal vents and cracks with a wet cloth. Call the fire department, and signal from the window with a blanket or flashlight. If you have to escape through smoke, crawl on your hands and knees, keeping your head one or two feet above the floor, where the air will be cleanest. Test doorknobs and space around the door for heat by using the back of your hand. If the door is warm, try another escape route. If it’s cool, open it slowly. Close it quickly if smoke pours in. Close doors behind you as you escape to slow the spread of smoke and fire. Do you know how old your smoke detectors are? Smoke detectors don’t last forever – they should be replaced after 10 years of service. Installing new smoke detectors every 10 years helps you protect your family and allows you take advantage of improvements in smoke detector technology. The best places for smoke detectors are on each level of your home and within 15 feet of your bedrooms. Every home should have at least 2 smoke detectors. 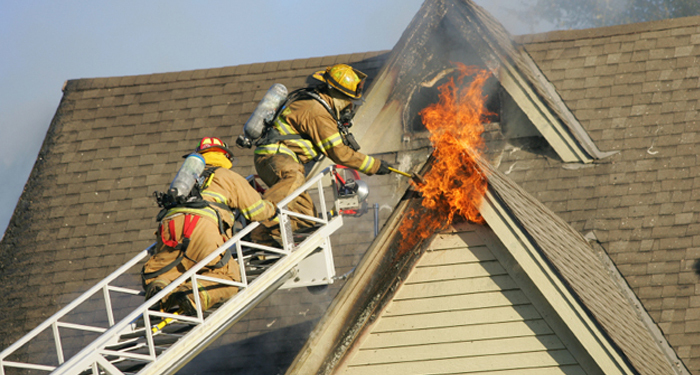 The larger the home, the more smoke detectors you must install for adequate protection. Mount smoke detectors in the middle of the ceiling. Do not install smoke detectors where drafts from fans or air ducts can reach them, as moving air can blow smoke away from the alarm’s sensor. In order to avoid nuisance alarms (like those caused by cooking smoke), keep smoke detectors at least 10 feet from stoves and steamy showers. According to the National Fire Protection Association (NFPA), the main reason for non-operational smoke detectors is dead or missing batteries. Test smoke detectors monthly, and replace batteries every time you set your clocks back or forward for daylight savings time. Carbon monoxide (CO) is an invisible, odorless, and poisonous gas. It is a common by-product of incomplete combustion when fossil fuels (like oil, natural gas, or coal) burn. Because you can’t see, taste, or smell it, carbon monoxide can kill you before you even know it’s there. Symptoms of carbon monoxide exposure can include headaches, fatigue, nausea, dizzy spells, and confusion. Since these symptoms are similar to the flu, carbon monoxide poisoning can be misdiagnosed. As levels of CO in the blood rise, victims suffer vomiting, loss of consciousness, and eventually brain damage or death. Illinois Public Act 94-741 requires that every dwelling place have a carbon monoxide detector installed within 15 feet of every room that is used for sleeping purposes.